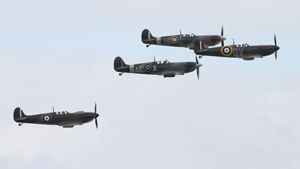 This year, Duxford’s September airshow was the finale of their season. Normally an airshow is held in the Autumn but I think the bad weather over the past couple of October shows has brought the curtain down on it. 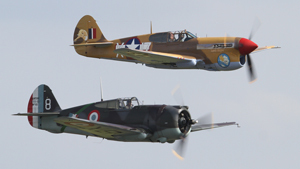 This year’s September airshow was a Sunday sell out. The Duxford team had secured a display by the Canadian Warplane Heritage Museum’s Avro Lancaster MK.X together with the BBMF’s Lancaster. With Saturday’s big star being the Vulcan, Duxford’s ticket sales must have been very healthy. Saturday’s weather in the morning was not great but luckily cleared up for the show. To kick off the day, A nice pair of Jet Provost’s flew a nice tight formation. 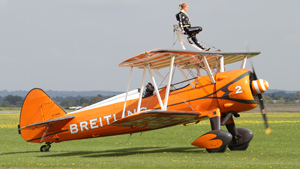 The Breitling wing walkers displayed on the Saturday only, as did the Vulcan. 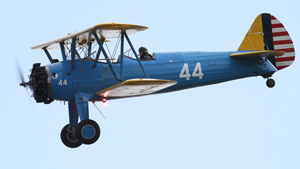 The BBMF flew their DC3 as a solo and another nice display was done by Golden Apple Operations Stearman. 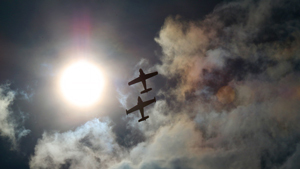 We had some nice blue sky for the Catalina, which was followed by TFC’s Curtiss Hawk duo. 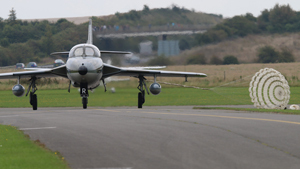 I did hear over my scanner that the Hawk 75 did have a small undercarriage problem, but landed safely. 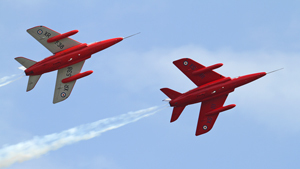 The Gnat display team from North Weald are finally starting to get about abit now and supplied a duo. We also had a cracking display from Radial revelation’s Fennec pair. 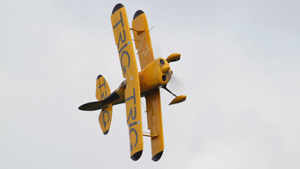 With aerobatics from Trig’s Pitts Pair supplying an inspiring display we were heading towards the day’s ‘Star’. Vulcan XH558 Arrived with the Gnat pair on either wing. 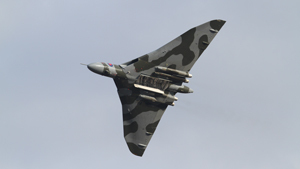 A superb entry and a sedate display by the Vulcan culminated in an amazing Climb out by 558. I was beginning to think the Vulcan was getting boring but the final climb added something that has been lacking of late. Well done Guys!!! The Great War Display Team were the star’s of the day for me though. 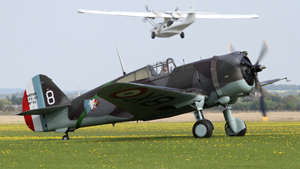 The guys have done a great job of trying to recreate the ‘confusion’ of early air warfare. 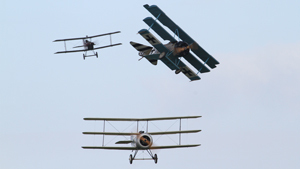 With 8 WW1 aircraft filling the skies, I believe they are the best display team in the UK at the moment. I really am looking forward to seeing the team next year. 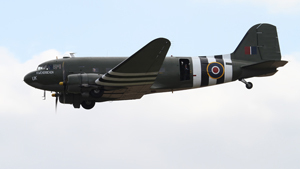 No Duxford airshow would be the same without a Spitfire tail chase and this was splendid. 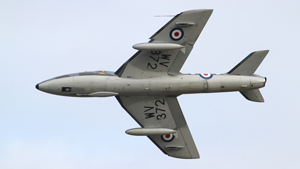 To bring to a close Saturday, Hunter T.7 WV372 from North weald did a very smooth display. Sunday’s weather started the opposite. It was beautiful sunshine in the morning with the weather deteriorating throughout the day. The display was much the same as Saturday’s, however their were a couple of ‘Gems’ added in. 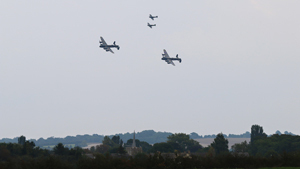 Duxford had filled up very early on the Sunday due to the display by the 2 Lancs. Reports of 6 miles of tailbacks on the M11 were filtering through as was word that people were ignoring the IWM’s advice of no ticket, don’t come. 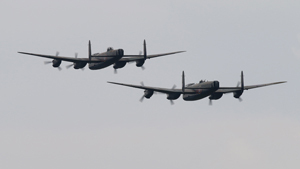 And the Lancaster’s didn’t disappoint. The Canadians UK tour has really been a huge success, with many non aviation enthusiasts coming to air shows just to see them. 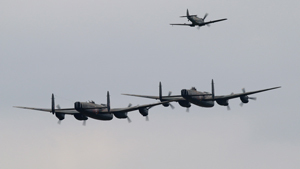 Upon their arrival, the crowd fell silent, as people watched the emotional formation flypast by the two Avro sisters. 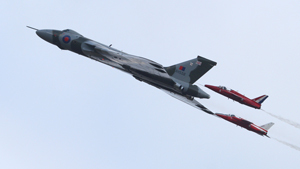 I don’t think any other aircraft (Even the Vulcan) have affected so many airshow goers. A sight probably never to be seen again. The other star of the day, but probably not to non enthusiasts was oil spill response’s B727. It was awesome to see the aircraft displayed within Duxford’s relatively small confines and for me, was one of my 2014 highlights. 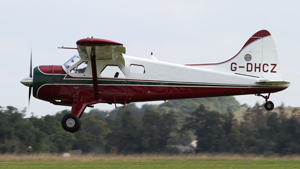 2014 is my final season as an airshow reviewer for airscene.co.uk. I would like to thank Ian Grigg for giving me the opportunity to cover the past few years on air scene’s behalf. 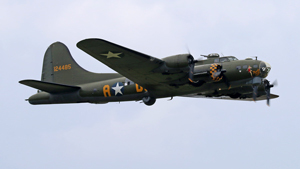 I’d also like to thank all the airshow teams, pilots and ground crews for providing such great aircraft and displays. I hope people have found my reviews worth a read. I will be returning to airhows as non press from now on…..